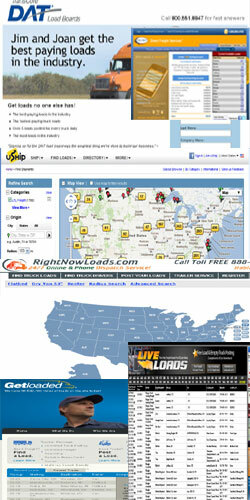 Load boards are databases where shippers and brokers post freight. O/O and Trucking companies can post availability of trucks. Some of these are hot loads they couldn't get covered and some will be just high volume freight that they know will get hauled at a good rate for one reason or another. There are many reasons that these loads are posted to a load board. Most company drivers will not have to deal with a load board. For new owner operators using a load board may be a little intimidating. You will hear stories about the cheap freight and also brokers going out of business and not paying drivers at all. As explained later, loadboards are useful tools to keep you moving and they are here to stay. Here are a few tips to help you feel more comfortable about using them. Most load boards will have some type of membership fee to use them. Talk to drivers and get feed back about the level of satisfaction they have with the load board that they use. I have heard many drivers speak well of Internet Truckstop, Get Loaded, and DAT, but I haven't used any of the load boards personally. I do know all loads boards are not created equal. Uship is relatively new type of load board that is gaining a lot of traction too. Many options to choose from At the end of the day, you see that there are many, many options to choose from in order to find freight. Some drivers think anyone in the middle man position between shipper and hauler is a crook. Reality is, the legitimate freight broker and legitimate load boards are important necessities to the trucking industry that will be here to stay for many reasons. Some companies outsource this job because logistics is either a minor nuisance or too complex part of their operation. Some companies find it cheaper to have this outsourced rather than hire and train new people. Also there will always be companies that are in growth limbo or transition where outsourcing is perfect even if temporary.You are going to have load boards and freight brokers. Best thing to do is ask questions to other drives about who they use and the level of satisfaction they have, so that you can patronize the best. There are many to choose . What Good Load Boards Have You Used? If you have questions about load boards or you have used a good load board post the comment or question below. What are you thoughts, ideas, or comments about the information on this page? Do you have experience with the topic. Can you give additional information? What's your story? What's your insight. What's your opinion? What's Your question? Share them with us! DO NOT make childish posts attacking people or companies. DO NOT abuse this site to get back at someone. You will be banned.